Visitors to the 31st annual Hoggetowne Medieval Faire can expect another rollicking show from the Gainesville-based performance troupe as it puts an epic spin on the battle between England and France. When you watch the Thieves Guilde rehearsing for the Hoggetowne Medieval Faire, you might think you’ve dropped in on an episode of WWE SmackDown or perhaps a live taping of The Jerry Springer Show. The Hoggetowne Medieval Faire is always full of surprises. There’s enough arm-twisting, eye-gouging, hair-pulling, head-butting, backstabbing and crotch-kicking to make you cringe and groan. However, the Thieves Guilde makes things a little more interesting by adding swords, daggers, double axes, quarterstaffs, morning stars, spears and other combat weapons to the mix. Think World of Warcraft meets Game of Thrones — but all for fun and fun for all. 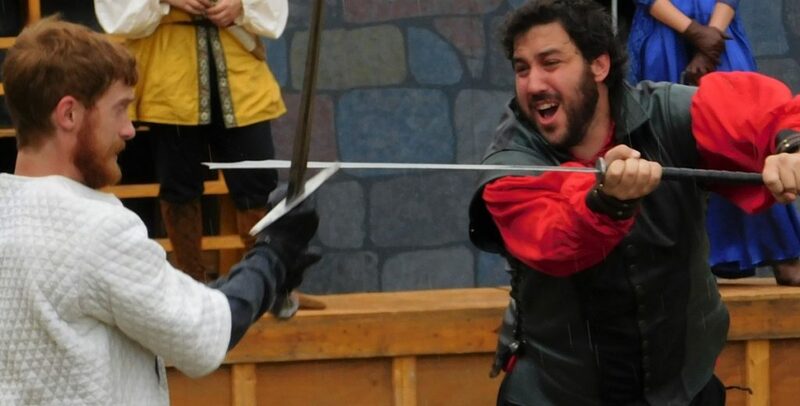 For the next two weekends, the Thieves Guilde and numerous other performance groups and individuals will be entertaining the masses at the 31st annual Hoggetowne Medieval Faire. The family-friendly event takes place at the Alachua County Fairgrounds off Northeast Waldo Road, adjacent to the Gainesville Regional Airport. 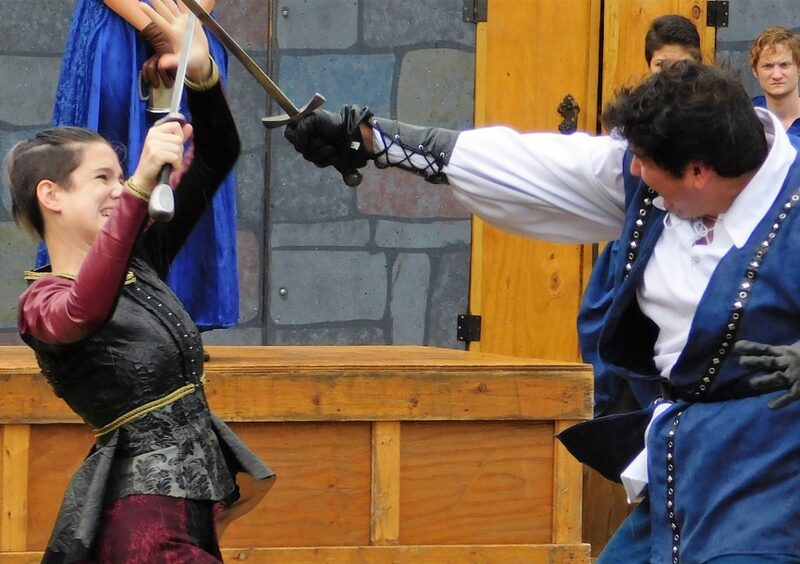 This year’s Faire features a Medieval market with 160 artisans as well as nine show stages with ongoing entertainment that includes everything from jousting knights and armored combat to magicians, acrobats and gypsy dancers. The always-popular Birds of Prey show features trained hawks and falcons that perform for the pleasure of the crowds. There will also be camel rides and human-powered push rides for young and old. 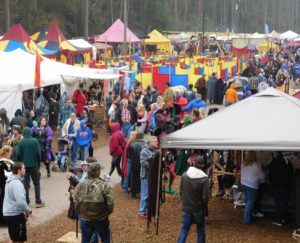 Produced annually by the City of Gainesville’s Department of Parks, Recreation and Cultural Affairs, the Hoggetowne Medieval Faire is expected to draw more than 55,000 visitors during its five-day run. 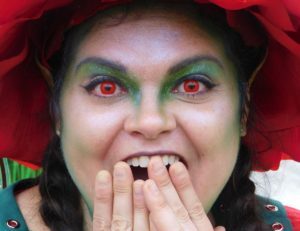 The Thieves Guilde, an all-volunteer acting troupe, has been performing at the Faire every year since 1993. This year the Thieves Guilde will perform three different scenes each day starting with the Royal Procession that begins with a welcoming ceremony at the Faire’s main entrance and continues through Hoggetowne’s crowded streets to the jousting field. One of the highlights of the Faire is the Thieves Guilde’s “Living Chess Board,” where performers represent chess pieces on a field painted to resemble a 64-square chessboard. When one piece is directed to take another, the two pieces then fight over which one gets the square. Each year the performance follows a new script written by Thieves Guilde members. “The inspiration for this year’s show is Eleanor of Aquitaine, who was at one point the most powerful woman in the world,” said Ryan Wolf, a Thieves Guilde member and this year’s show director. With that theme as their backdrop, the Thieves Guilde cast its four lead characters after a lengthy audition process. 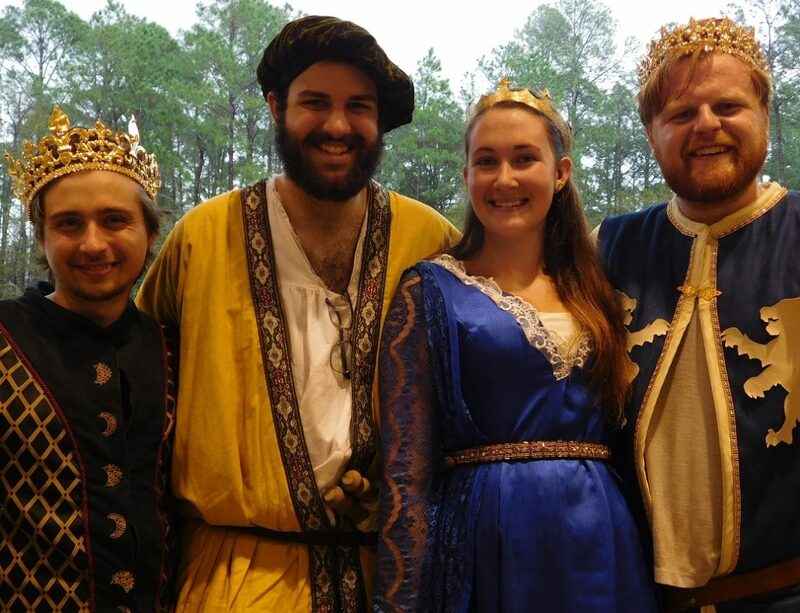 They are Sophia Skoglund as Eleanor of Aquitaine, Brandon Cotter as King Henry II, Alex Christophy as King Louis VII and Ethan Ellis as the Mayor of Hoggetowne. However, the pun-filled banter between the main characters onstage is basically an excuse for the Living Chess Board to come alive. Fact checkers beware: The story might not be historically accurate. The Thieves Guilde performs two different scenes that feature fighting. The first scene has 11 fights while the second scene has 17 fights because it is a slightly longer show. In all, about 50 members perform while others work at the kids kingdom, the fencing booth and the Stumble Inn refreshment vendor. Thieves Guilde members spend months practicing the fight scenes, which, for the most part, involve actual weapons. Members are trained through Guilde instructors who get inspiration from the Society of American Fight Directors. Allan Thompson, assistant fight coordinator and head sword trainer, has taught more than 300 Thieves Guilde members proper fighting techniques for the past two decades. 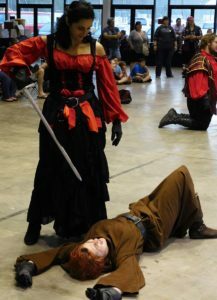 Although Andrei is the Hoggetowne Medieval Faire event coordinator, she also serves as the Thieves Guilde’s fight director. She also happens to be Thompson’s wife. Because of her added responsibilities, Andrei will be on the sidelines this year after many years of participating in the festivities. Saturday and Sunday, Jan. 28-29 from 10 a.m.–6 p.m.
Friday, Feb. 3, from 9:30 a.m.–3 p.m.
Saturday and Sunday, Feb. 4-5, from 10 a.m.–6 p.m.
$17 for adults ($7 for ages 5–17). Friday admission is $8 for adults ($3.50 for ages 5-17). Discounted prices for school groups. For further info, visit the Hoggetowne Medieval Faire website.